Do you love your CPAP but hate traveling with it? 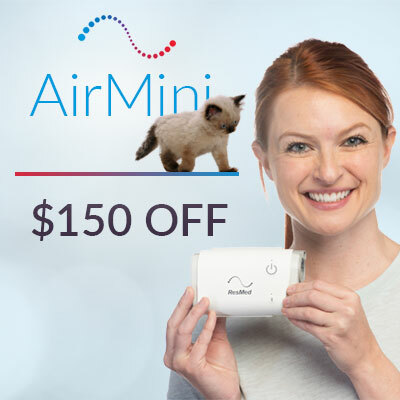 The AirMini Auto travel CPAP is the smallest, lightest CPAP machine in the world. At just 0.7lbs, the AirMini offers a compact design without compromising quality. 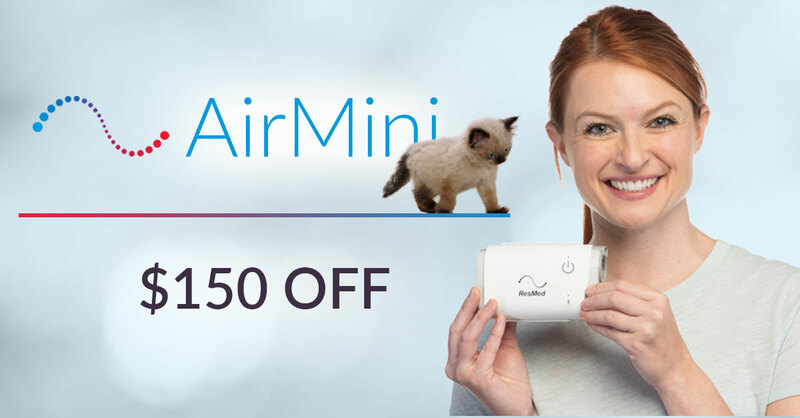 For a limited time, save $150 when you buy the AirMini Travel CPAP! 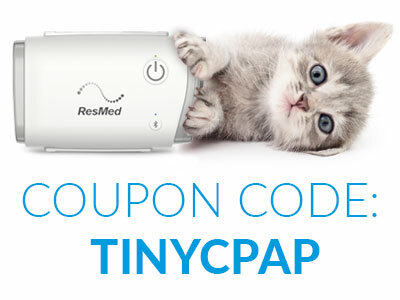 Just enter the coupon code TINYCPAP at checkout. Compact and convenient: The AirMini weighs only 11 ounces. Powerful and quiet: Auto-titrating machine adjusts to your pressure needs as you sleep. Control in the palm of your hand: The AirMini smartphone app gives you complete control over your CPAP therapy. Comes with a complementary mask: Choose from the AirFit P10,the AirFit N20, or the AirFit F20. What are people saying about the AirMini Travel CPAP? “I pitched my 10 year old clunker that I hated messing with and replaced with this nice mini model. Traveled out of town recently and it was compact for packing and worked well with first use. I like the mini humidifier cartridge versus filling up with water. Advise using the HumidX Plus versus the HumidX for better moisture. Very happy with the new purchase.” —Ron H.
“Bought this unit just days before a trip to Europe. It worked brilliantly, and the size and complexity savings is huge when traveling with just a carry-on. In a month I stayed in 4 countries (UK, Germany, Netherlands, Norway) and in all kinds of hotel rooms and AirBNB’s. Worked like a champ, just as good as my full size Airsense.” —Jeff A. “I’ve been using a cpap with humidifier for about three years. Traveling on an airline with the bulky cpap was a problem and yearly trips to Europe packing a cpap was much too cumbersome. I’ve been using the AirMini for about a week with the P10 nasal mask. The last five nights have been perfect for me. Can’t wait for my next vacation taking the small AirMini with me. 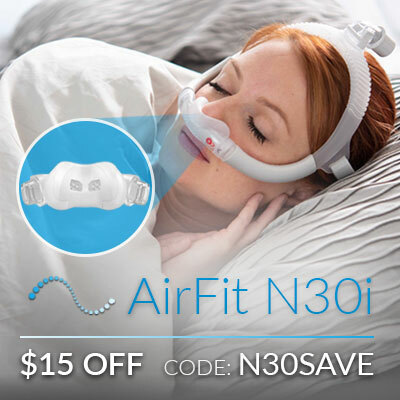 No more waking up tired with a sore throats from snoring all night without a cpap!” —Steve G.
The brand new AirFit N30i Nasal Mask, ResMed’s most minimal nasal mask yet, is available now! Priced everyday at $124, order now and get the N30i for just $109! Just enter the code N30SAVE at checkout. Tube on top and minimal design: Gives you the freedom to read, chat, and wear glasses before bed, and to get closer to your bed partner. SpringFit frame: Get a personalized, secure fit with every use. 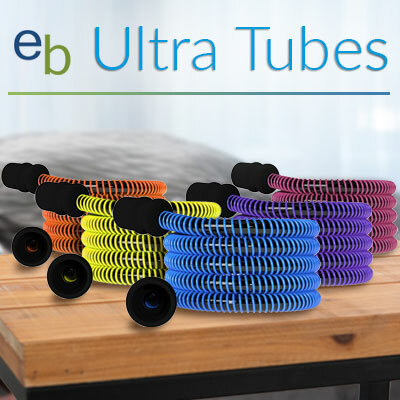 Brighten up your CPAP therapy with the first ever colored Ultra CPAP Tubing by Easy Breathe! For a limited time, get $10 off your new colorful tube. Just use the code ULTRA10 at checkout. Choose from SIX colors: Available in blue, purple, pink, yellow, orange, and black so that you can customize and bring color into your CPAP therapy. Universally compatible: These non-heated tubes work with all CPAP and BiPAP machines. Slimline: Sleek, lightweight, and aesthetically pleasing. Increased durability: Reinforced rubber cuffs prevent the cuff from separating from the tube. Made in the USA: Manufactured by Easy Breathe and made in the United States. *One offer redeemable per order. Cannot be applied to insurance or previous orders.